Today was a very proud day for us on campus at Champlain College – Lennoxville. We celebrated our student volunteers with a banquet, where we unveiled Jake Rose’s incredible sculpture, designed with such compassion, care and intent, to hold the stone decorated by Rehtaeh Parsons’ mum, Leah Parsons. After Rehtaeh’s dad, Glen Canning’s visit with us last year, we decided that this would be a way of making Rehtaeh’s memory an honourary student among us at Champlain forever, in solidarity with her family. Jake was a member of last year’s Champlain Cougar Football provincial champions, winners of the coveted Bol D’Or. He is currently attending Bishop’s University, and playing football for the Gaiters. 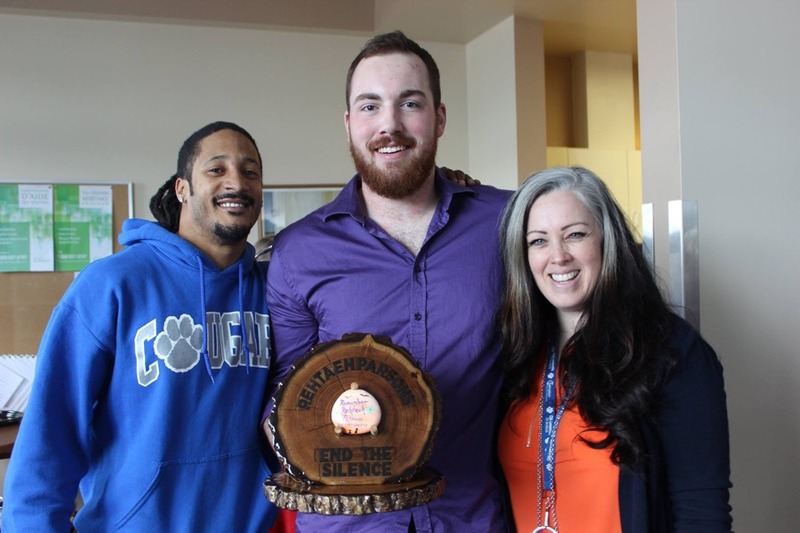 When Leah sent us the stone, it, and Rehtaeh’s story, was shared with this year’s Cougar Football team, by Shawn Naylor, a member of the coaching staff. Shawn was instrumental in hosting Glen last year, providing leadership and care. Jake’s sculpture will live on campus, and is open for hosting, by faculty and services that would like to give it a temporary home, until it finds its permanent home among our trophies. Jake made the sculpture out of a piece of butternut wood that was felled during a storm near his home in New Brunswick. It had been drying in his uncle’s garage for about a decade. This was very much a family effort, Jake’s parents are also very proud of his accomplishment. He did this to honour Rehtaeh’s memory, to help promote the importance of consent, and to create awareness about the serious impacts of cyberbullying. So proud of you Jake!!!! The Champlain community was humbled by this story, and is proud to remember Angel Rehtaeh.